This weekend 10 states have eagle-watching festivities over King Weekend. And that doesn’t count three more states (OR, NY, NJ) that have eagles right over a river on their border. 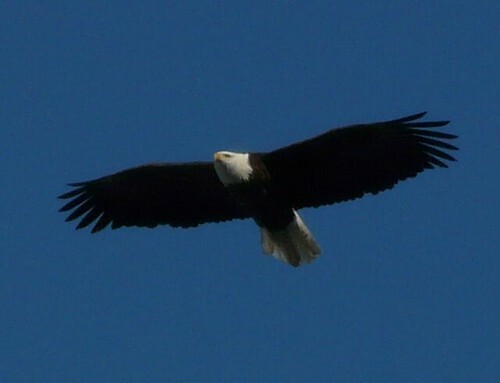 The recent cold spell seems to be pushing eagles further south. Northern states are reporting slow seasons while those in Alabama and Kentucky are having strong years. Dates State And where is that? Peak Number of Eagles Details Jan 8-Feb 7 AL Lake Guntersville SP The area gets more than 100, but tours see about 15-35 Eagle Awareness Weekends offer accessible viewing spots to see where eagles nest and hunt. Eagle experts (some with live birds) give talks inside the lodge, too. Mid Jan-Feb CA-OR Lower Klamath Basin on the CA-OR Border 500 The Lower Kalmath Basin National Wildlife Refuge gets up to 500 bald eagles each winter. According to the refuge, the birds arrive in November but the best viewing is in January and February along the Tule Lake and Lower Klamath auto tours. Lower Klamath is the country’s first waterfowl refuge. Over a million birds visit for the winter, including white pelicans, Pintail, gadwall, and canvasback ducks. You may also see Sandhill Cranes and antelope. September is a perfect time to put on a silly dog event. Now that the weather has cooled, we have two great events this weekend: a basset hound waddle in Illinois and a poodle party in New Hampshire. In Illinois this weekend, we’ve got a nice basset hound waddle. Around the country basset breed rescue groups raise money to save dogs by having parades. 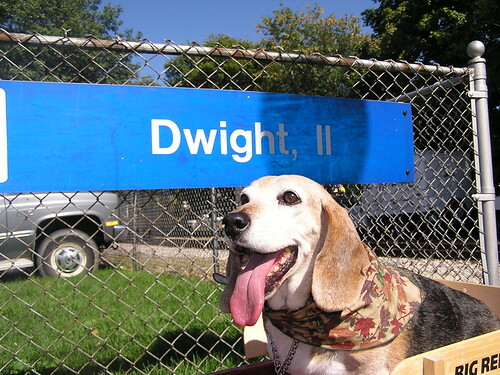 Typically, a rescue group –in this case Guardian Angel Basset Rescue–gloms onto a small town parade–here it’s Dwight, IL’s Harvest Days. The bassets quickly become the star of the show–even though they are uniquely ill-suited to parading, what with their sloth, girth and enthusiasm for saying hi to everyone. You can absolutely go basset-less, have a great time and say hi to as many bassets as you want. I’ve gone to the Dwight Waddle, riding on the basset coattails of my sister’s goofy dog Bacon. You’ll see a sea of bassets; they hope for 1,000 this year. And they have plenty of hounds up for adoption. My sister is going and I hope she falls in love with one. Next week the Calgary Basset Rescue Network (see their Facebook fan page) has its fourth annual waddle .